I want to be able to display the sum of the values on top of the bars. Below is my code and under that, an illustrated image that displays the values I want to show. Can this be done? makes it so that the values reside inside the bars. Without it, a sum of values are stacked on top of the bars. 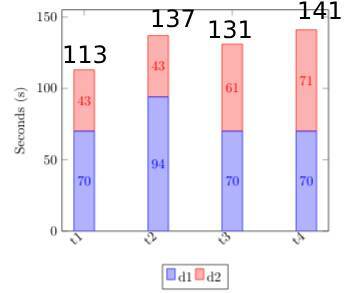 I do however want the sum at the top, then the value of each bar displayed inside of them, just as in the illustration. Browse other questions tagged tikz-pgf plot or ask your own question. How can I get titles on the top of grouped bars? How to avoid that stacked bars overlaps error bars?